Casiopeia Forum - View topic - Classpad II fx-CP400 hardware - a hidden SD card reader ? View topic - Classpad II fx-CP400 hardware - a hidden SD card reader ? Classpad II fx-CP400 hardware - a hidden SD card reader ? Today let's discover the Casio ClassPad II fx-CP400 hardware together. It seems that is the second version of the motherboard, but of the first version of the power supply board. We can take that with two distinct boards, a future version powered by a rechargeable battery would be quite easy, and the system already supports it. The motherboard seems to have a setup close to the ones found on most recent Casio graphic calculators USB (Casio fx-9750Gii/fx-9860Gii, Casio Prizm fx-CG10/20). 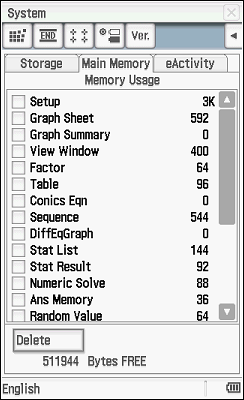 About the RAM, the RAM chip was also 2MB on the Casio Prizm, but only 64KB were available for the user. And here in a similar way, we've only got 512 KB available for the user! About the NAND Flash ROM, if the informations found on the official website are accurate, the chip should have a capacity of 32MB, but only 5.5MB would remain available for the end user. at position CN703, an unsoldered connector! This CN703 connector with its pinout of 9 contacts and one lateral contact, and by its shape that gives an empty space on the board is clearly a connector for an SD memory card reader! Unlike older Casio Classpad models, it is possible to add a SD card memory reader to the ClassPad II! We're not sure if Casio has a future project for this since it would be a forbidden module by exam regulations of some countries (including France). Traces of SD memory card reader support were already found on TI-Nspire and even on Casio Prizm fx-CG10/20 operating systems, although they were clearly missing from the hardware. In fact, it seems those readers are used during hardware development where they give a way to reprogram or emulate easily the content of the ROM memory during tests - and so avoid permanently bricking the calculator prototypes with bad code: you just need to switch the SD card. Seems to have pretty much the same hardware as the Prizm - 2 MB RAM, 32 MB NAND, and maybe even the CPU is the same but just clocked at a higher speed (the Prizm CPU can go over 400 MHz I think, it's only the peripherals that force it to run slow, otherwise it would crash). The Prizm's motherboard model is, if I remember correctly, LY755, and this one is LY777. As for RAM "available to the user", you certainly mean "Main Memory capacity". On the Prizm, add-ins have access to over 600 KB of RAM (stack+heap, letting alone ILRAM and RS memory...). Someone from cncalc in 2010 also found a hidden SD card reader in Casio fx9860g Slim and tried to make an hardware mod. Currently I do not need a SD card reader, 24 mb are enough for me. If anyone wants to try, there are some sd card options in Diagnostics to test.